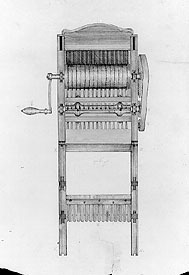 click image for close-up In October of 1793, Eli Whitney sent a drawing of his new invention, the cotton gin, to Secretary of State Thomas Jefferson in application for a patent. Jefferson replied on November 16 that "the only requisite of the law now uncomplied with is the forwarding a model, which being received, your patent may be made out & delivered to your order immediately." For more than a year, Whitney struggled to construct a full-size working machine, based on his original smaller model that had taken him only ten days to create. As Whitney described the device in a letter to Jefferson on November 24, 1793: "The cylinder is only two feet two inches in length and six inches in diameter. It is turned by hand and requires the strength of one man to keep it in constant motion." Finally, in February 1794, Whitney completed the model to his satisfaction. In March he took it to Philadelphia to demonstrate it in the office of the Secretary of State, in order to receive his patent. The patent that Jefferson had approved the previous November was issued to Whitney on March 14, 1794.